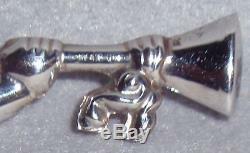 1972 Stieff Smithsonian Sterling Gabriel Angel Xmas Ornament Pendant. Extremely Hard To Find Gabriel Angel Sterling Ornament / Pendant made by Stieff for the Smithsonian Institute in 1972 is in very nice vintage condition. Made by The Stieff Company for the Smithsonian Institution in 1972, this representation of the 1883 Archangel Gabriel weather vane is from the Institute's collection. Gabriel was a familiar sight signaling wind direction in late nineteenth century America. This is stamped sterling, however it is so faint it can barely be seen even under magnification. It measures 4 7/8 inches long, and 1 5/8 inches tall including the hang ring. There is no original box included, but it will arrive in a new anti tarnish pouch suitable for safe storage. Any gold tones or spots you see are the result of poor photography. There is no damage on this, but it will exhibit faint scratches consistent with use and polishing. As with all vintage silver, it may need proper polishing upon receipt depending on your preferences. If by some small chance your item is not satisfactory, your return should still be received within 7 days or less. Be sure to check my other listings for more ornaments from Stieff and other major manufacturers, plus many collectible Christmas sterling pendant /medallion / ornament / charms, and other great gift items, Victoriana, Elegant Glassware, Vintage Clothes and Shoes etc. Thank you very much for your interest. I look forward to doing business with you! Thank you in advance for your highly valued and greatly appreciated business. The item "1972 Stieff Smithsonian Series Sterling Silver Gabriel Angel Ornament Pendant" is in sale since Tuesday, December 07, 2010. This item is in the category "Collectibles\Holiday & Seasonal\Christmas\ Modern (1946-90)\Ornaments\Metal".